Sighing from Boudoir(闺中怨, Gui Zhong Yuan, Guzheng, 古筝) was Mr. Wang Shengwu(王省吾) scores. It was original Henan folk music. 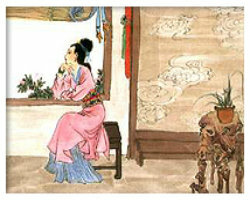 Enjoy Sighing from Boudoir(闺中怨, Gui Zhong Yuan, Guzheng, 古筝) in your browser now (just click the Play button below).